Sweet friends, it’s here!! Today my new Die of the Month – Softy Spoke’n Flip and Gatefold Card is available!!! This is always an exciting day for me – a reveal. I worry over these things like a mother hen, always wanting to make sure I’m offering something that is stash-worthy, that it will allow you to make many things, that when your recipient gets your cards they will gasp and that you get a great value packed with options. It’s very easy to design a die but it’s the other stuff – extra planning, consideration and forethought on uses that goes into the mix that makes a great die. November’s Die of the month sold out and I wanted to say thank you! Softly Spoke’n is a set of 9 dies that have to be one of the most versatile sets I’ve made to date. The main motif is characterized by a lovely design of spokes that are punctuated by mini dots — very much in the style of Gingerbread Architecture — that are the perfect landing place for a gem or pearl. Out of the box, this card makes a no-brainer gatefold card without any calculating or measuring. 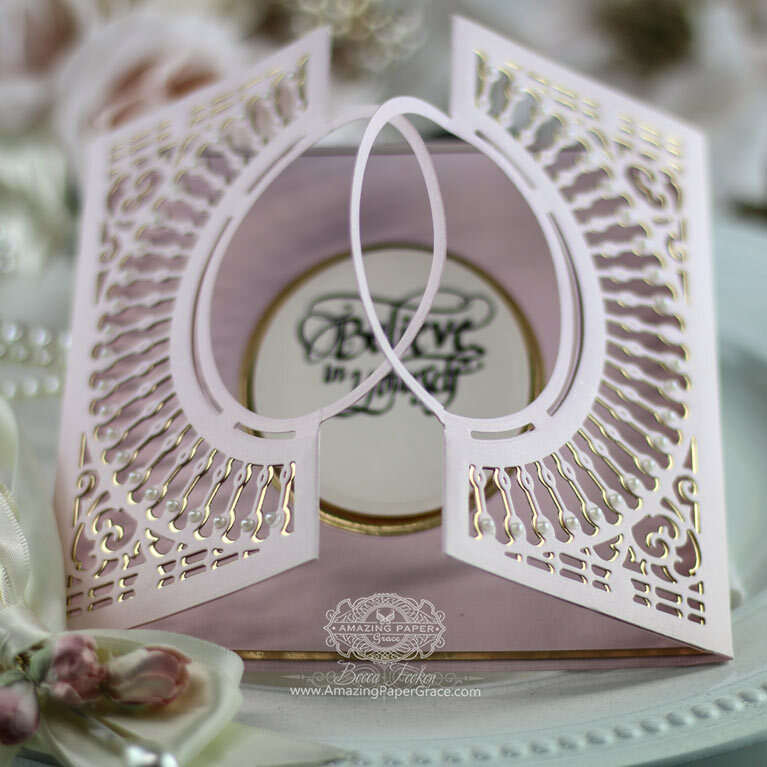 But, the wonderful thing is that the combination of dies can be transformed into anhttps://www.youtube.com/watch?v=kttN8ii6Wwoything you dream of – a gatefold card, a goodies box, a basket, a pocket card, a candle wrap, a background, tags. There are enough rims, inlays and pieces in the kit that give you the flexibility to use the dies any way you want. Here’s how it works – this is a 6″ die and on one of the four sides (for flexibility of use) there is a score line instead of a cut line. Want to make a 6″ x 6″ card? With paper that is 6″ x 6-1/4″ cut once. Since this is an intricate die, I recommend turning up to 90 degrees and running it through your machine again. Trim along score line. That will give you a background. Want to make a gatefold card? With paper that is 6″ x 12″ cut once, orienting your paper so that the scoreline of the die is at the bottom. Since this is an intricate die, I recommend turning slightly up to 30 degrees and running it through your machine again. This will give you a 12″ panel and you need two of these. Fold on scorelines – there is a scoreline in the center of the motif and a scoreline at the 6″ mark. Overlap and adhere the two solid parts of the panel. 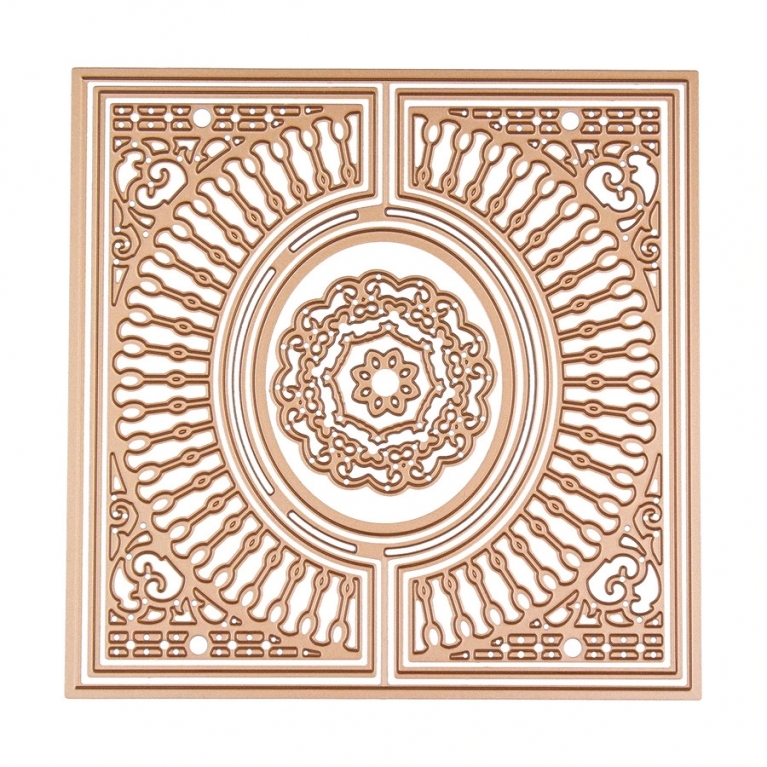 As your motifs fold toward the center you will get a double thickness on the spoked detail, adhere those two thicknesses together to give you a solid flap on your gatefold. Add your embellishments and a closure. Options! If you don’t want to cut the whole front of the card at once, you can break it down. Run through the square frame of the die that also cuts the oval then add your inlay or inlays and run through a second time. By the way, there is a packaging insert that comes with the Die of the Month that will show you how to put this card together. Since it was my main inspiration I wanted to show it here. For this particular card, I used a Quietfire Design sentiment from the If You Don’t Believe in Miracles Set. I have several inspiration posts planned (while the die is available). Want to see more of what I made with the die? 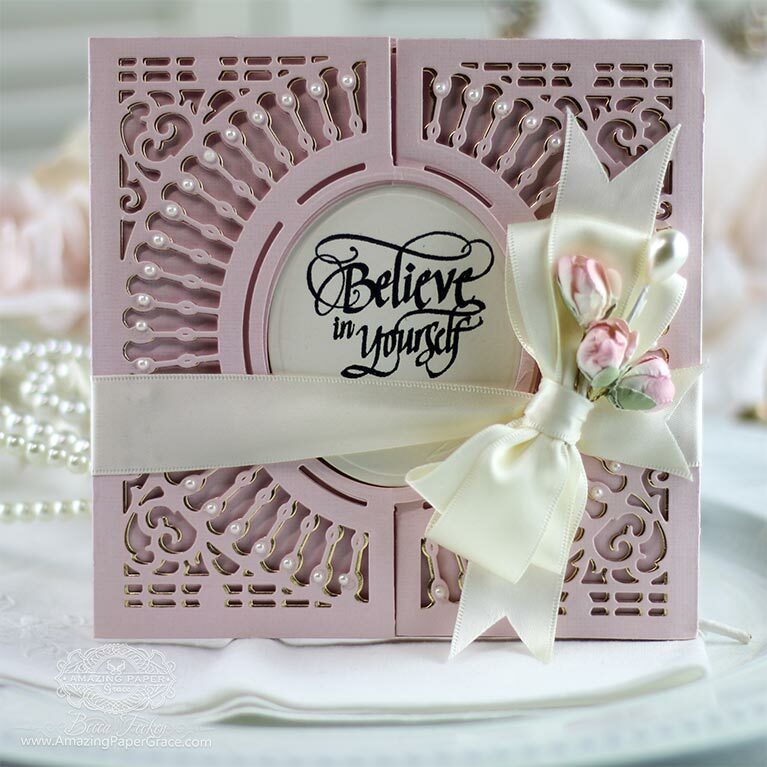 Pop right over to THIS POST on the Spellbinders Blog and you’ll see some additional items I created! Thanks so much for stopping by today!! I’ll be back soon with more inspiration!! Good morning Becca, congratulations this is going to be a winner!!! It’s absolutely lush!!! Wow Becca. This is absolutely fantastic and will, I am sure, be a very quick sell out. The projects you have made are so, so beautiful. Congratulations on another winner. 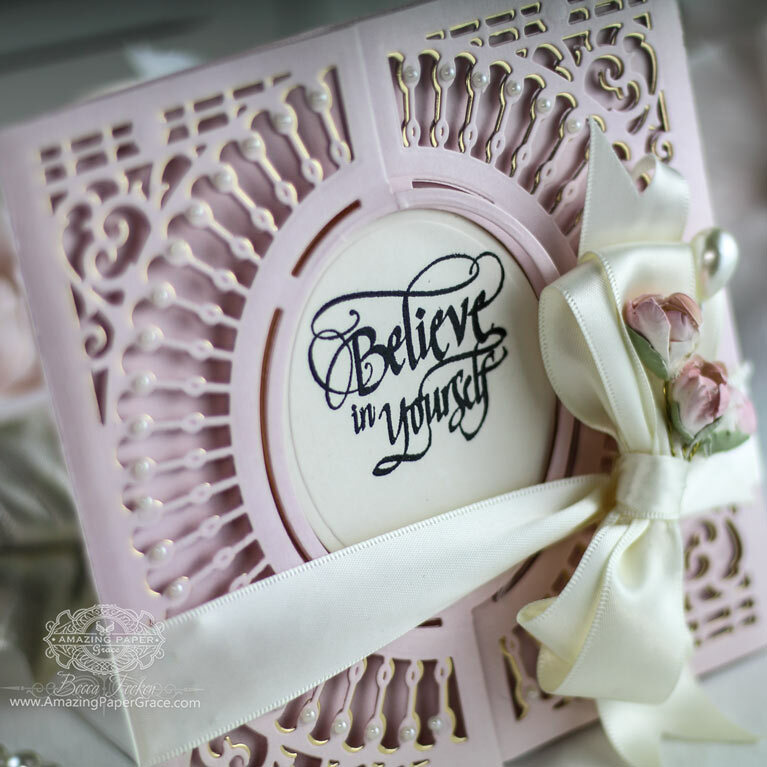 Are you going to Spellbinders website? You can try clicking on the link in this email. It is near the top of the post. Click on the name of this nw die. It should take you right to the correct spot. I have the die and it is beautiful!! Im new to your site. Very pretty die. I saw on Instagram and had to see more. Another fab die, Becca! You just keep hitting the ball out of the park! Oh my goodness, this will make me well in no time. This is totally spectacular! and I can’t wait to get it. Thanks for speaking with me today you are such a special beautiful person!! you have done it again lucky club members go girls ! but hope you are getting there. so sorry for the people who are caught up in these events ! You have no idea how much it hurts to see these and not be able to afford UK. But i do have nearly all of your collections so i guess i’m lucky girl in that respect. 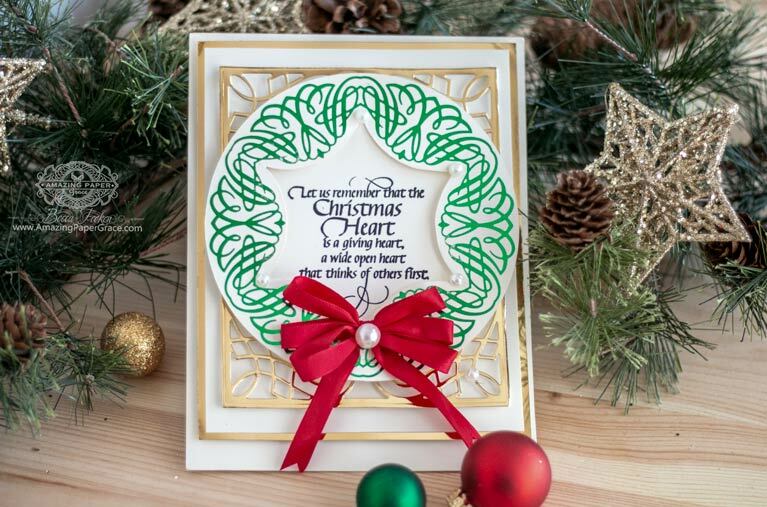 Sweet friends, I’m popping in today to share a card for the Christmas stash using an “everyday” glimmer plate – yes, the love for Spellbinders Glimmer Foil System continues! Stay tuned, at the end of my post, I’ll share our blog hop prize winners. Plus, did you know I’m in another countdown? 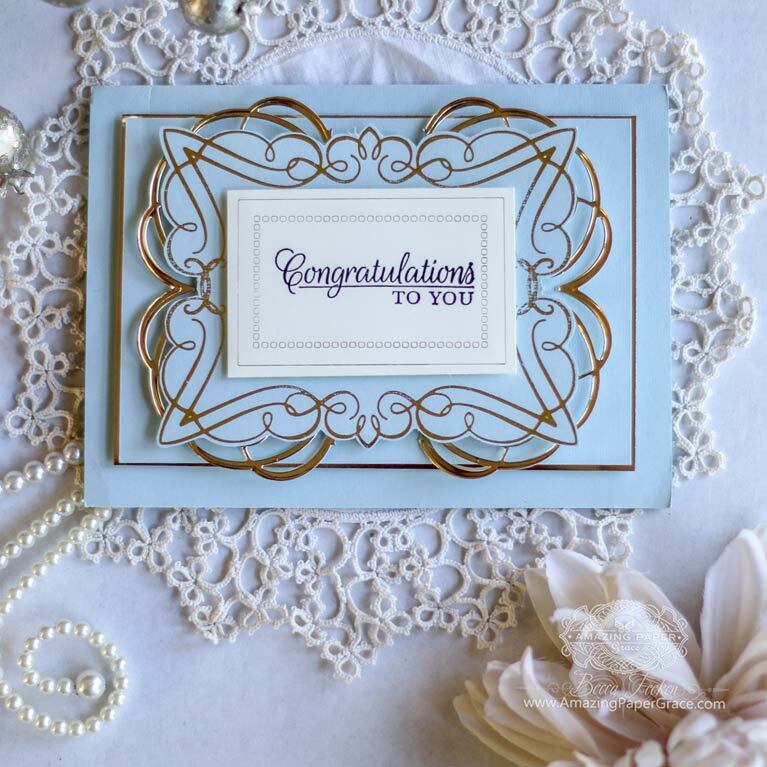 Last month we released the brand new Amazing Paper Grace Die of the Month Club and it sold out fairly quickly!! Well, guess what? 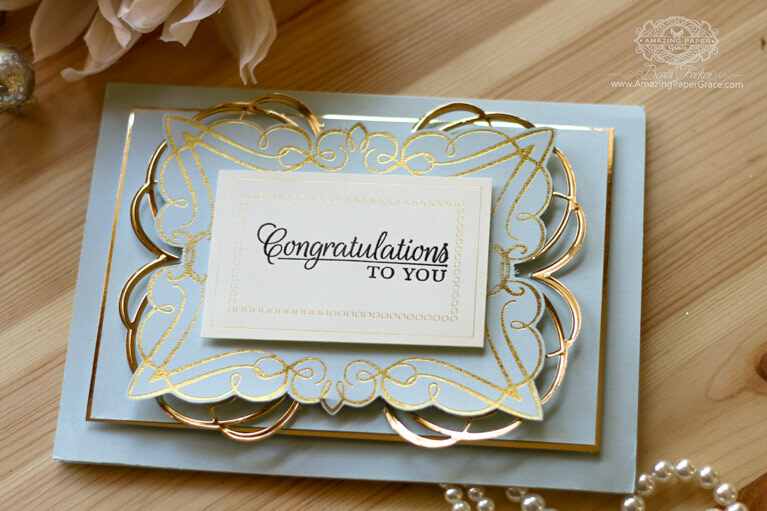 For my card today I’m using the Glorious Glimmer Elegant Circle Glimmer Plate and I’ve layered it on top of A2 Corner Cotillion – it doesn’t get much easier than that!! 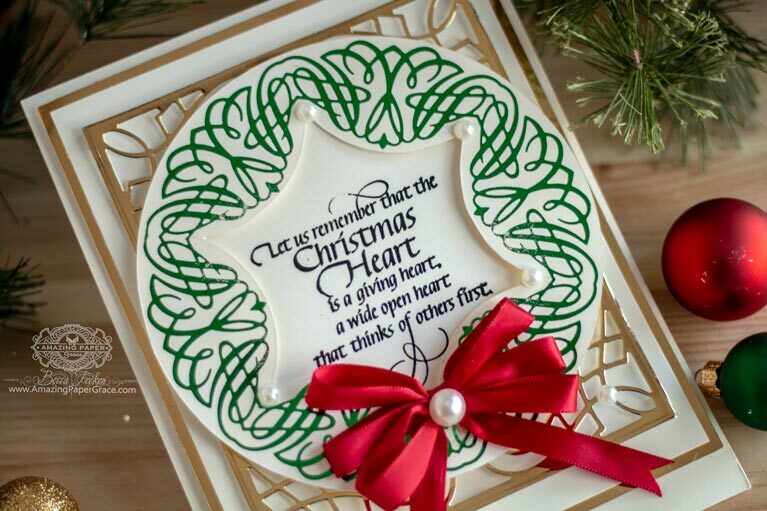 It’s what I call an “everyday” glimmer plate because you can use it to accent a holiday, a wedding, or simply to build layers in your cards – it looks great peeking out from underneath a die or another layer. The calligraphic strokes of the design make it translate to almost anything. As you know, I’m extra happy to dabble with the new foils so I took one of my new designs and pressed it into Christmas use. The Elegant Circle Plate so reminded me of a wreath so I cut out the center and added a bow. 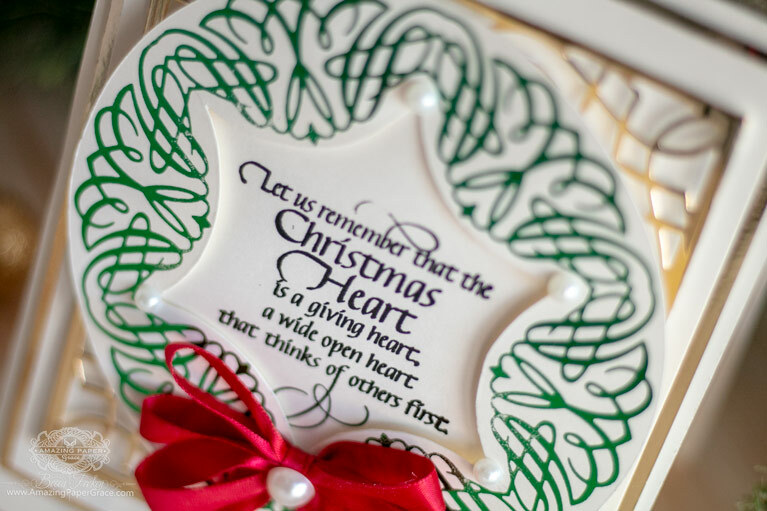 With the center cut out, it gave me a lovely frame and was the perfect shape to highlight a lovely Christmas Sentiment from Quietfire Design. You might wonder how I cut this out because I’m not a fussy cutter, I’m just not! Easy peasy, I dug through my stash for a circle die to cut out the outer ring and a circle cutter would do the job too. Then I took a smaller circle die and pencil and traced the half circle arcs in the center of the motif by hand. With the pencil marks, I couldn’t go wrong. Questions about the Glimmer System? Check my post HERE for FAQ’s. 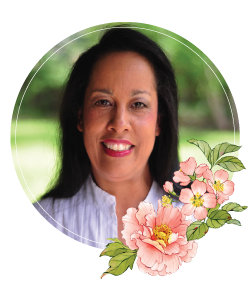 Thank you so much joining us during our Glimmer Blog Hop last week. We’ll be stretching our Glimmer creativity over the next couple of weeks to come, so be sure to stop by as we share more. Good morning Becca, another fab card!!! 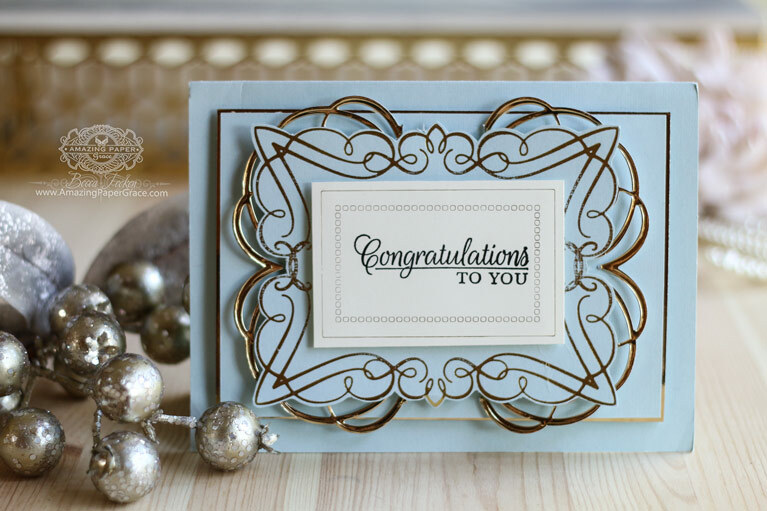 I just love the glimmer plate card sentiment. That is so true and wouldn’t it be lovely if everyone felt this way year round. Merry Christmas to all. Remember …. It’s All About Jesus. Lovely card! Congratulations to the lucky winners. Enjoy your fabulous die! Love the star shaped centre cut out, Becca! And what a beautiful sentiment! Don’t know how I missed this post as I am always atune to anything FeedBlitz but missed it altogether until today. Hi just like Ann I missed this one too ! Lovely effect keep glimmering lol. Well done winners … Winners are GRINNERS !